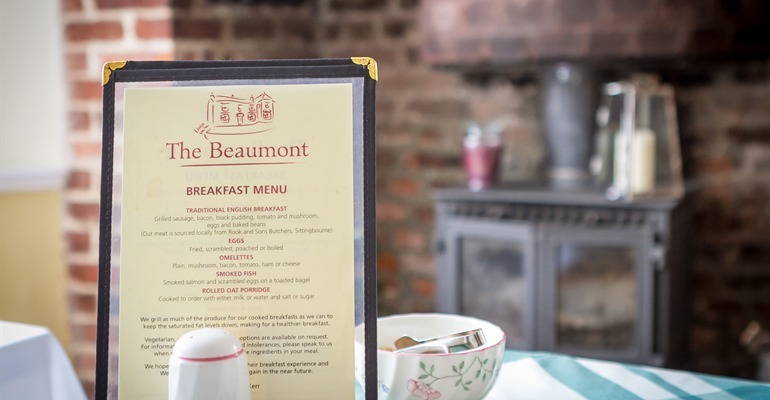 Bed & Breakfast Accommodation and Afternoon Teas – all available at the Beaumont! Iain & Liz Kerr are pleased to welcome you to The Beaumont! We’ve only been here since 2015, but the building has been here since the 17th Century. We are delighted to be carrying on the tradition of offering quality Bed & Breakfast accommodation in Sittingbourne. We have clean, comfortable, well-appointed rooms, a guest lounge with a small library and film collection, computer for guest use, free fast Wi-f, friendly service and an excellent breakfast served in our garden room! We offer an easy solution to accommodating everyone when friends or family come to visit, or if you’re planning an event (birthday, wedding, christening) and your guests need somewhere to stay. You could even come and join them for Breakfast in the morning! We are conveniently located on the A2, within easy walking distance of Sittingbourne town centre and train station and a short journey to Kent Science Park and Eurolink Business Estate. We have a small private car park. All rooms have tea and coffee making facilities, hairdryer, a television with freeview channels, complimentary toiletries – to say nothing of our free fast Wi-Fi! In the morning we offer an early breakfast with a wide range of options to meet any appetite! As a special Sittingbourne ME Offer, if you phone and book using code ‘GIVE ME A BREAK’ then we’ll give you £5 discount per night on your stay! New for 2016, we are delighted to offer AFTERNOON TEA! Enjoy freshly prepared sandwiches, scones with cream and jam, homemade cakes and a choice of teas and coffee. Ideal for a special occasion or just as a treat! Teas are £12.50 per person and are served between 2.30pm-5.30pm on Sundays (see below for dates). If requested in advance, then special diets can be catered for. Gift Vouchers are available – so you can treat someone special too! To book accommodation, an afternoon tea or for more information, then call Iain & Liz on 01795 472536.